Residents of Kinangop scamper as ‘dead’ man resurfaces – Kenyatta University TV (KUTV). All Rights Reserved. Residents of Magumu in Kinangop Nyandarua county were left in shock after a man ‘buried’ two agos reappeared forcing some of them to scamper in fear. 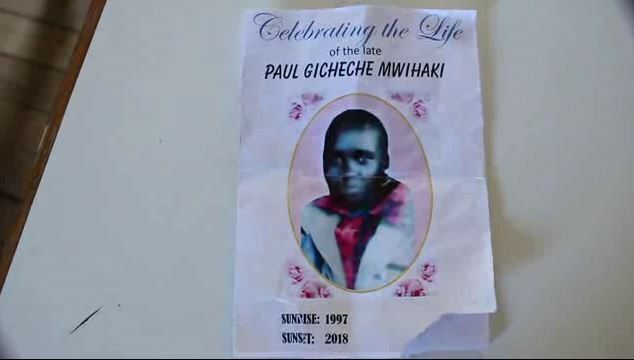 Some of the relatives broke into tears of joy as the 21-year old Paul Gicheche arrived back home while others fled following the bizarre incident. The grave was still fresh and the wreaths had not wilted as the family that lives in Mutonyora village tried to come to terms with the loss of their kin. Gicheche went missing in September and the family reported the matter to Magumu police station where they pointed an accusing finger to one of his former boss. Late lsst month two bodies were found dumped in Ngumbi forest off the Limuru-Mai Mahiu road and taken to Naivasha sub-county hospital mortuary. The family positively identified one of the bodies as that of Gicheche and a post mortem was conducted on the 5th of November and later buried on Tuesday. However, on Thursday evening Gicheche presented himself to the police station in an incident that attracted hundreds of area residents. Addressing the press, the causal labor who looked shaken said that all along he had been working in the nearby Longonot trading center and was not aware of his ‘death’. “There was no Tv, radio or even mobile phone where I was working and I was shocked when I returned home only to learn that that I had been declared dead and buried,” he said. He added that the process of seeking a court order had started so that the body that was wrongly buried could be exhumed and returned back to the mortuary. “The mother positively identified the body as that of his son before the postmortem and burial and the reappearance of Gicheche has caught many by surprise,” he said. For the last couple of months, several bodies have been found dumped along Ngumbi and Kinale forests with indications that they were murdered through strangulation. In all the cases, the bodies which are taken to Naivasha sub-county hospital mortuary are middle aged youths and do not have any identification documents.